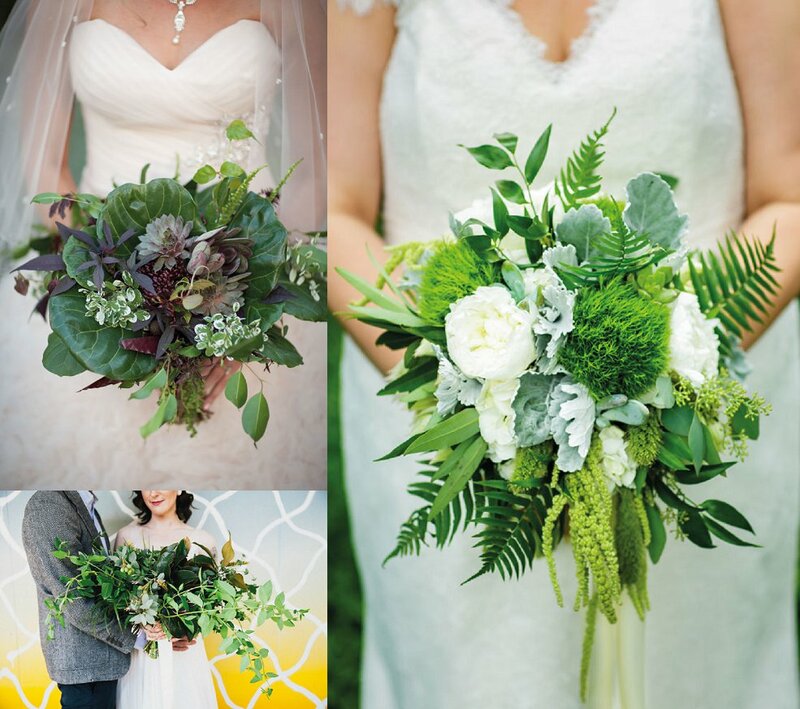 Bouquets loaded with greenery are leading the way down the aisle. These bountiful florals create the feeling that the bride gathered the blooms from a field of flowers. And while oversize bouquets are trending, keep in mind they require heavy lifting and can hide your beautiful bridal gown. Smaller bouquets have just as much of an impact with their delicate beauty and subtle details. Whether a bouquet is petite or grand, go for lush and green with an organic vibe. (above) Kristin Banta Events designed an urban garden for Kim and Mike’s wedding at Los Angeles’ Vibiana that was filled with green botanicals, moss and overgrown trees. 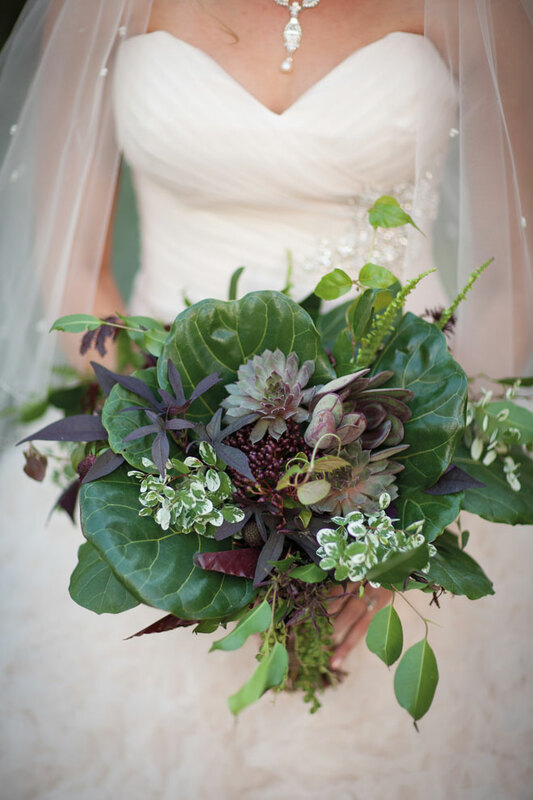 The textured and dainty bridal bouquet created by Krista Jon for Archive included ferns, fig leaves and succulents, with subtle hints of plum. 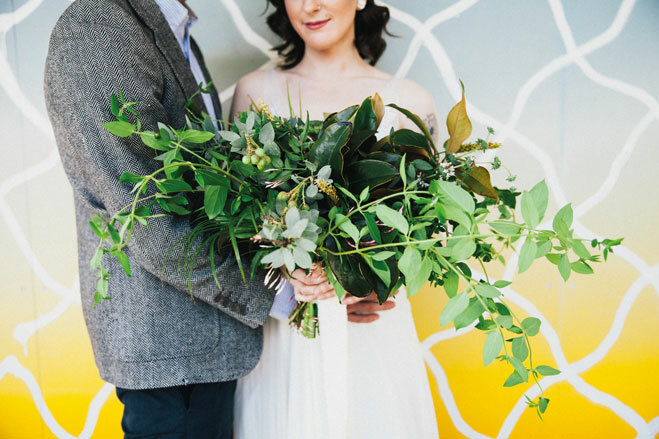 (above) For this bohemian-style photo shoot by Alexandra Wallace at the funky Goodland Hotel in Santa Barbara, Forage Florals opted for native varieties that included big berry manzanita, abutilon, magnolia, honeysuckle, oats and scented geranium. And true to the florist’s name, 100 percent of the florals were gathered from the grounds of its Santa Rita Hills ranch. (above) Merrily Wed designed a Tuscany-meets-Tahoe wedding for Ali Genet and Robert Neumann at a private estate in Tahoe. 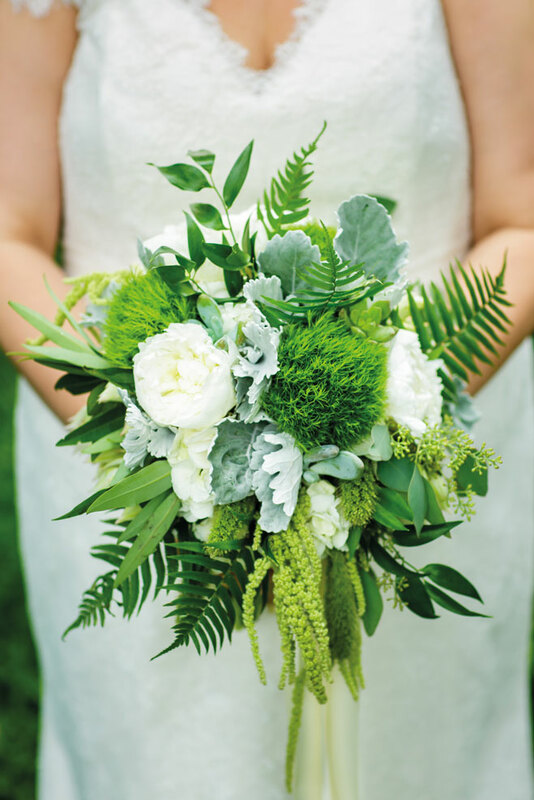 Botanica Events captured this vibe with a delicate, nature-inspired bouquet boasting shades and textures of green foliage and flowers that included peonies, “Green Trick” dianthus, dusty miller, brake fern and hanging amaranthus. (below) Wink! Weddings’ Layne Kula designed a romantic Indian summer celebration for Gabrielle and Diwan’s wedding at Whispering Rose Ranch in Solvang. 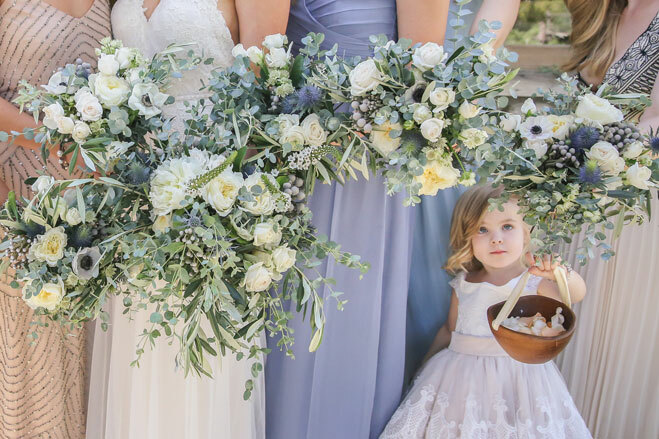 Florist Hollyflora captured this essence with a lush, textured and airy bouquet composed of white and ivory blooms with accents of silvery blue and gray brought by thistle and eucalyptus. “Nothing beats organic olive branches and free-flowing silk ribbon for a gorgeous and relaxed feel,” says Kula.